i have the two products from Dermelect Cosmeceuticals to share with you all today! (they are press samples, kindly provided to me for review). these two products are designed to work in conjunction with their color polishes to make the perfect manicure. 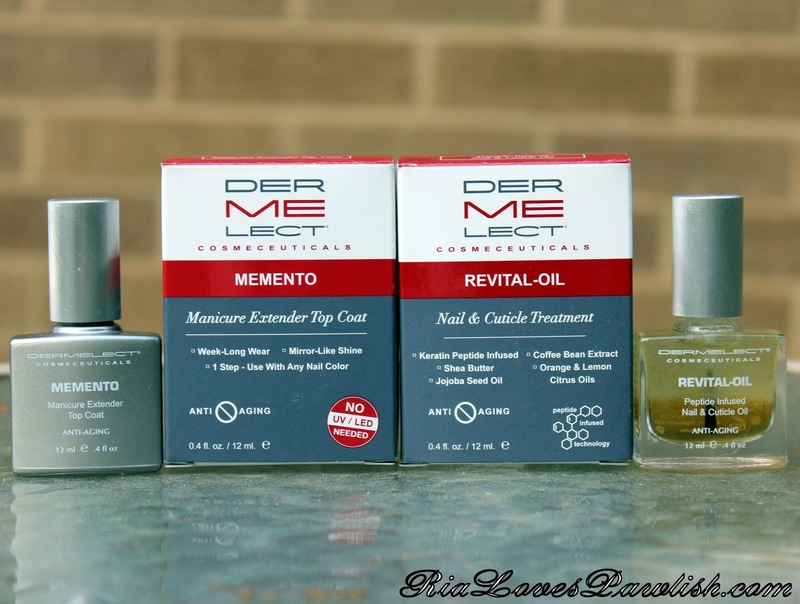 they are the Memento Manicure Extender Top Coat and the Revital-Oil Nail & Cuticle Treatment. let's kick off with the Memento Manicure Extender Top Coat! this topcoat dries to a nice a shine and really helps keep a manicure from chipping. i only had a little tip wear after wearing it for a few days... except for my nails that shredded because they are so weak. these polishes and treatments contains ingredients to help your nails' health, but it's not enough my ultra damaged nails, i would need to use a strengthening basecoat under it the mani. Dermelect recommends using two coats of topcoat to really help your mani last. after experimenting with both one and two coats, i found that two makes the polish way more shiny, but both ways help with keeping them from chipping. the company also recommends letting the topcoat dry for at least 8 minutes before moving on to the next step... Revital-Oil! 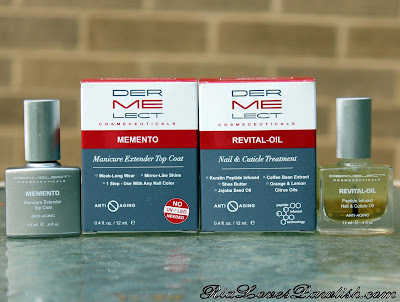 Dermelect Cosmeceuticals challenges people to use their products and only complete a manicure in only 20 minutes... i found that it's definitely possible to do it that quickly, but i'm a slow poke. i tend to watch tv and take my time while painting my nails, so speed isn't super important to me. you can purchase Dermelect products at their website, www.Dermelect.com. their color polishes and Revital-Oil retail for $14, the topcoat retails for $16!